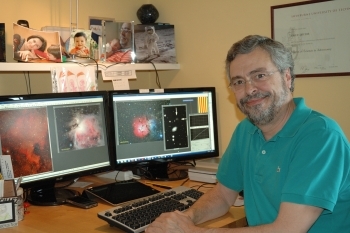 I am 62 years old, come from a Catalan-Spanish family, hold a MSc in Chemistry, a PhD in Chemistry (both at the Universitat Autonoma de Barcelona, Spain) and a MSc in Astronomy (Swinburne University of Technology). After a 20 year long career as Managing Director in several companies, I retired three years ago, with the intention of devoting my free time to my two passions: my family and astrophotography. I currently teach astrophotography at the Agrupación Astronómica de Sabadell (AAS with 1000 members). Some 18 months ago, I developed a project to find a method to calculate the minimum exposure time to get a "decent" image. This project was concluded thanks to the invaluable contribution of some co-members at the AAS with a great deal of images and their parameters. This method allows the calculation of the exposure time of any object, point-like or "deep-sky objects", as well a using the same equations to determine the ISO sensitivity of a CCD camera, using known exposure times of images of stars with known magnitudes. The method uses as variables the telescope's aperture, its focal ratio, the sensitivity of the camera, the tabulated surface brightness or the magnitude of the object to be imaged as well as its dimensions (in arc-minutes). It provides the exposure time in seconds for each subframe. Astronomy has been one of my passions since I was 18. I soon got binoculars and bought my first scope when I was 30. Two years after that I started taking pictures with it. I prefer to image deep-sky objects. Imaging quasars has been one of my challenging goals within astrophotography (my first picture of 3C273 was taken in March 1995 on TMax400 film). Recently, I started a personal project to try to get images of several faint, and far away, quasars. As long as my equipment is limited (11-inch SCT with an ISO 5500 camera, 6.3 MPx), I decided to mix in iTelescope's scopes. Imaging faint point-like objects requires very long exposure times or moderately long ones if imaging with large aperture telescopes and CCD cameras with high ISO sensitivity. Being my telescope and camera both moderate in these parameters, iTelescope.Net came immediately to mind. The best combination of aperture and sensitivity is given by T17 (43cm aperture and an extraordinary IR-sensitive camera with an ISO sensitivity of 35000). In this project (the full lecture on it was presented in May 2014) several quasars have been imaged at a redshift ranging from 0.158 (3C273) and 5.18 (J140025.54-12957.02). At this point, knowing that Christian Sasse's world record was a very faint quasar with a z=6.41, I tried to get an image of J112001.48+064124.30, having a z=7.08 (other high-z-quasars have a high north declination and therefore out of T17's sight). Its light is so much redshifted, that its spectrum starts to have some intensity beyond 920nm. The attempt failed and then I redirected the goal to a faint galaxy showing a redshift of 6.7014. According to its surface brightness (visible magnitude and size roughly calculated from the image from SDSS DR9) and the above mentioned calculation method, the exposure time had to be 310 seconds, if imaging with T17. The galaxy is indeed visible in all (15x300seconds) subframes I took in two different nights. The recorded high z galaxy is not as dim as the previous record holder quasar (it has a tabulated g-Mag: 18.40, low for an extended object), but its light has been travelling for nearly 13 bn years (it left when the Universe was only about 820 Million years old). This galaxy lies well within the reionization period (it ended at about z= 6.1).